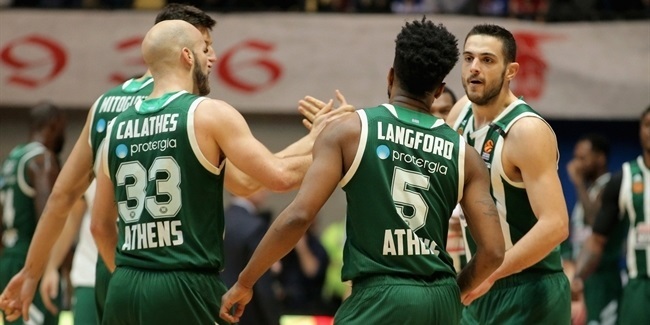 With his Panathinaikos OPAP Athens going on the road for a crucial game in the playoffs race, point guard Nick Calathes produced one of his finest performances to bring the Greens close to clinching a top half finish and earning the MVP of the Round honor in the process. Panathinaikos downed AX Armani Exchange Olimpia Milan 83-95 on Friday night, and Calathes starred by scoring 27 points on 12-for-17 two-point shooting, dishing 14 assists, pulling down 8 rebounds and registering 2 steals. His performance index rating of 39 was the second-highest of his career, while Calathes matched his season-high in assists, set his personal best with 12 two-point shots, and 27 points were his third most in 178 EuroLeague games. 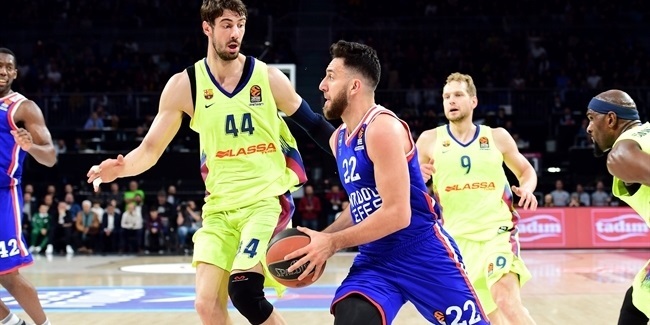 Behind Calathes, KIROLBET Baskonia Vitoria-Gasteiz center Vincent Poirier had a PIR of 30, the second best of this round. In a victory over Real Madrid, Poirier collected 19 points and a career-high 16 rebounds. Two players accumulated index ratings of 25 this round: Jeremy Evans of Darussafaka Tekfen Istanbul and Ante Tomic of FC Barcelona Lassa. Evans had 14 points, 5 rebounds, 4 steals and 2 assists in a loss against Zalgiris Kaunas, while Tomic had 13 points, 6 rebounds, 5 assists and 1 steal in a defeat at FC Bayern Munich. Rounding out the list of top performers are Marcus Eriksson of Herbalife Gran Canaria and Milan’s Mindaugas Kuzminskas, each with a PIR of 24. Kuzminskas had 17 points, 6 rebounds and 3 assists, while Eriksson had 24 points and 3 rebounds in a win over Olympiacos Piraeus. Calathes was the top scorer of this round with 27 points. Milan’s Mike James leads the EuroLeague in scoring this season with 20.4 points per game. Poirier was the top rebounder of Round 28 with 16 rebounds, and he is also the new league leader with an average of 8.0 boards per contest. Calathes had 14 assists, tied for most in a single game this season. That allowed Calathes to increase his lead atop the season’s assists charts with 8.8 per game. The Darussafaka duo of Evans and Dogus Ozdemiroglou led all players this round with 4 steals. Calathes is also the season leader in this category, averaging 1.8 steals. Buducnost VOLI Podgorica center Goga Bitadze had 3 blocks, the most of this round, but Real Madrid’s Walter Tavares leads all shot-blockers with 1.7 per game. There were four double-doubles this round: Calathes, Poirier, Baskonia’s Johannes Voigtmann with 13 points plus 12 rebounds, and Johnny O’Bryant of Maccabi FOX Tel Aviv with 16 points and 11 rebounds.